Days to Maturity: 60-90 Full Sun. 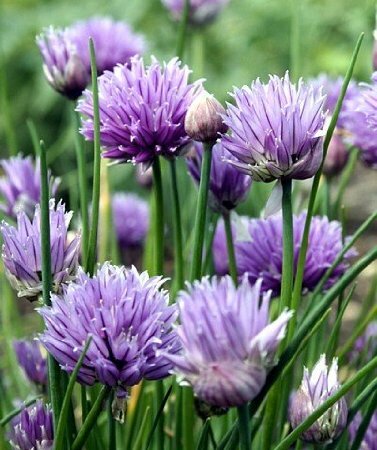 Hardy in zones 3-10 Chives grow in clumps, with their round, hollow, grass-like leaves reaching a height of 9 inches or so Lavender Flowers Immediate shipping in 3" pot. Chives grow in clumps, with their round, hollow, grass-like leaves reaching a height of 9 inches or so. The stems are firm, straight, smooth, and, like the leaves, bright dark green. The flowers, which bloom for two months in midsummer, form round deep purple or pink globes that make an attractive garnish. Although they thrive in any good garden loam, chives show a preference for slightly acid soil and need to be kept moist throughout the growing season. In climates with hot summers, choose a location where they can enjoy some shade during the day. Divide established clumps of bulbs every third spring, and transplant clusters from the outer edges of the clumps. Alternatively, chives can be raised afresh each year from seed. Remove the flower heads to maintain a constant supply of flavorful leaves. The foliage dies down in the winter. You can encourage a few early spikes by covering some of the plants with crushed leaves or straw, or plant clumps in containers in the fall for early spring chives. Make sure your container chives get plenty of sun. For an attractive garnish, allow a few plants to produce flowers. Chives are easier to snip with scissors than cut with a knife. The snipped chives give a hint of onion flavor to egg dishes, cheese souffles, salads, soups, cream cheese sandwiches, and sour cream dressing for baked potatoes. Chive butter is great with grilled chops and steak.